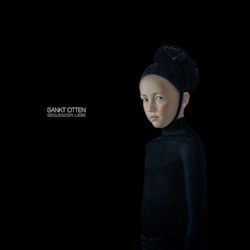 I don’t know if Sankt Otten are getting better with each album, or if repeated listening to their body of work makes me appreciate them more with time, but their fifth and newest longplayer seems to have caught my attention more than their previous records. Another reason for this may be that they made Sequencer Liebe a rather short and concise affair without any long tracks that gets quicker to the point. The duo consisting of Stephan Otten (keyboards, drums) and Oliver Klemm (guitar, keyboards) have discovered recently their love for warm analogue synthesizer sounds, and the album title suggests from the start that we get a lot of sequencer parts that remind strongly of early German kraut artists like Tangerine Dream. Then there is also a more ambient side to Sankt Otten, where the guitars do their best to emulate the pioneering work of Robert Fripp. To lighten the mood, there are finally some Eighties tinged synth pop tracks. On this album, Mr Otten opted for digital drum sounds only, which might sound derivative in any other context, but combined with the lush synth banks, they make for a pleasant hybrid, merging the best of Seventies ambient and Eighties pop. Sequencer Liebe is from beginning to end a labour of love, that much is clear! The opener and title track may very well be a nostalgic and above all drum-free tribute to the golden age of sequencer music, but the following material packs a bit more punch with the overly effect laden drum sounds, warm and melancholy synth leads and heartbreaking melodies. The only more uplifting moment comes with the fast paced Der Heilige Schmerz. My only complaint is that the overall sound is a little too strong on the high notes, but considering their music being based in a time where heavier basses were not so frequent, I will not consider this a major drawback. At times I feel like complaining that the album is a little short, but then maybe that’s exactly what makes it so powerful, allowing no time for unnecessary lengths. Fans of synthesizers and sequencers should have a great time with Sequencer Liebe.